When ocean waters are too warm, corals can become stressed, causing them to eject the symbiotic algae they rely on for food. Known as bleaching, this process turns the corals stark white, making them susceptible to starvation and death—and it’s getting worse because of climate change. However, a new study offers some hope for Earth’s coral reefs, suggesting that while corals near the surface will continue to cook and bleach, coral species in deeper water could fare much better. Survival in the depths may give corals a fighting chance. The deeper areas of reefs, with their cooler waters, had been proposed in marine conservation circles as potential “refugia” for corals struggling against climate change’s effects. But until now, little work has been done to quantify how corals handle bleaching at varying depths. Most surveys of bleaching’s impacts occur in the shallow, upper 10 meters or so of the reef, which are exposed to the most severe temperatures. Without tracking species-specific impacts of bleaching at different depths, it hasn’t been possible to determine whether deep reefs can act as safe zones. To address this knowledge gap, a team of scientists from Australia and New Zealand looked to the Maldives, an island nation located in the equatorial Indian Ocean between Madagascar and India. The Maldives has been especially brutalized by the recent global coral bleaching event, with some 60% of the coral colonies affected. The research was conducted at the height of the 2016 carnage, as a part of Project ‘Regenerate’, a coral conservation-focused Maldives Government project implemented by the Maldives Marine Research Center and the International Union for Conservation of Nature (IUCN). The team conducted surveys of coral bleaching at Ari Atoll in May of last year, carefully selecting reef locations that allowed for bleaching to be recorded at a range of depths. They picked ten different places around the atoll, scuba diving on three reefs at each location, at three depth ranges: 3 to 5 meters, 9 to 11 meters, and 24 to 30 meters. At each reef and depth category, the team identified the coral species, recording the proportion of corals bleached and the severity of the bleaching. They also noted whether or not corals were shaded from direct sunlight, or grew underneath overhangs on the reef. 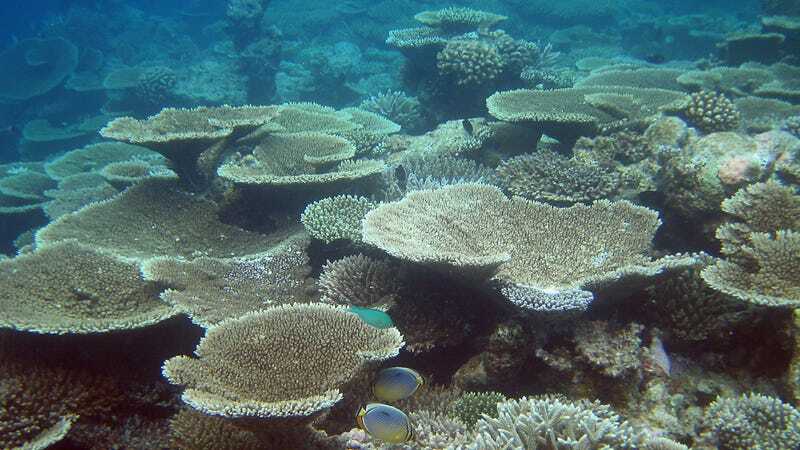 Their results, now published in the Proceedings of the Royal Society B, were clear: corals in the deeper part of the reef were less likely to be bleached, and less likely to be bleached badly. Individual corals in the shallow depth rung of 3 to 5 meters down were 2.5 times more likely to experience moderate to severe bleaching than the corals in the deepest rung (24 to 30 meters). Some species were more susceptible to bleaching than others, but of the coral species that were present in the shallows and the deep reef, nearly all showed reduced bleaching effects in deeper water. Increasing depth was even helpful to species only found in shallower water, with more than 70% of these exclusively shallow species experiencing reduced bleaching at 10 meters down. Corals in more shaded locations, sheltered from some of the solar radiation, also experienced less bleaching. Importantly, differences between reef locations accounted for very little variation in bleaching degree, meaning that the connection between depth and bleaching was the major factor in a wide range of places. The persistence and resilience of coral colonies in deep reefs could be a big deal for the long-term survival of corals in the face of climate change. Even if shallow reefs become inhospitable to many species of coral, it’s possible the deep refuges could eventually re-seed the shallows in the event conditions improve, sidestepping local extinction. However, corals have other, grim challenges that go well beyond warming oceans and bleaching. As rising carbon dioxide makes seas more acidic, reef-building corals might be replaced outright by their gummy, acid-tolerant relatives, the zoanthids. Even deep corals might not be able to escape the nasty impacts of other forms of human pollution, like agricultural runoff.